Lord, incline our hearts to keep this law. This continues the five-part series on the catechism presently used by the Anglican Church of North America (ACNA). The first three parts are linked under "related reading" at the bottom of this page. What is the Second Commandment? Comment: Note the specification of things in heaven above, things beneath the earth, and things in the water under the earth. The description of the earth at the center with the firmament (waters) above and the firmament (waters) below comes from Genesis 1. The things above and the things below are hidden from us or only partially known. They cannot be adequately represented by any image that even the most talented artist could create. Any attempt to show an image of these things fails. It always misses the mark, falling short of the glory of God. Abraham's people understood this. 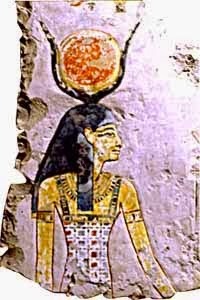 That is why they used the sun as an emblem of the Creator and did not worship the sun. The sun was portrayed as serving God as a solar boat and as YHWH's chariot. The overshadowing of the ruler by the sun meant his divine appointment. This was indicated by the Y, symbolizing the long horns of the Ankole cow. The original context is that of Abraham's Nilo-Saharan cattle-herding ancestors. On ancient images, the Y image appears as a cradle for the sun and as a crown on the head of the one who is divinely appointed. This is why many of the Horite rulers have names beginning with Y in Hebrew: Yishmael, Yitzak, Yacob, Yosef, Yisbak, Yaqtan and Yeshua are examples. A widespread image of the Y crown is shown right. This image depicts the divine appointment and overshadowing of Hathor, the mother of Horus, the son of the Creator. The Horites were devotees of the Creator, Hathor, and Horus. At Nile shrines, Horus was often shown as the Calf of God resting in a manger. His mother is shown wearing the symbol of divine appointment. the sun cradled in the long horns of the cow. It was long expected that a "woman" of the ruler-priest lines would be overshadowed and conceive the "Seed" of God who would "crush the serpent's head" (Gen. 3:15). What does the Second Commandment mean? Comment: The bottom line is that images are not to be worshiped or adored. However, as any parent who has sat to read a book to a preschool child knows, images are helpful. We use images in books to educate children. The younger the child, the more images we use. As the child grows, the books have less images and more text. Images were used throughout the history of the Church to inform illiterate people about the Gospel. Stained glass windows were used to tell the story of Jesus’ life, passion, death, resurrection and ascension. Statues of Mary and Jesus were placed in side chapels and for centuries people have prayed while contemplating the images. In the Orthodox churches the icons that are front and center are those of Jesus (on the right as one faces the most holy space) and the Theotokos (on the left). Contemplation and veneration of these icons draws the Christian deeper in the mystery of the Incarnation by which God redeems the lost and begins renewal of the material world. In the eastern churches Mary is rarely shown apart from her Son. Most icons of Mary show her holding the Christ Child. She is the “Theotokos” – the God-bearer, the appointed and overshadowed Woman whose cooperation with God fulfills the expectation of the Righteous Ruler who is salvation (Yeshua). In this sense, Mary is a model of the obedient and fruitful Christian life. The honor the Virgin Mary is shown in the Church is the reason Feminist interpretation of the Bible ultimately fails in logic. How did Israel break the first two commandments? Comment: In Biblical theology disobedience has consequences and the consequences are viewed as divine punishment. Doubtless, some consequences described in the Bible were natural outcomes, but others, such as the plagues of Egypt, represent supernatural interventions. So it is that the Habiru/Hebrew are repeatedly warned not to transgress the order of creation (as in homosex and onanism) or to violate the moral code. The moral code, represented by the Ten Commandments, strictly forbade following after the deities of other peoples. Yahweh alone is to be worshiped and obeyed. He is not like other gods. Yahweh's nature cannot be adequately represented by any created thing. And this is where things become very interesting! Among the Habiru, the appointed ruler with his council of ruler-priests ideally served as the earthly counterpart of the heavenly council and therefore these rulers were called "gods" or elohim. The Horite ruler-priests were regarded as deified "sons" of God. They are called "gods" (elohim) as in Exodus 22:28: "Thou shalt not revile the gods (elohim), nor curse the ruler of thy people." It becomes evident that in Horite theology the living creature alone can embody righteousness, and among living creatures, only the human has the potential for deification. No image of stone or metal qualifies. Further, it is evident that the ruler-priests could use this claim to bolster their power among the people, as did Sargon (Biblical Nimrod) when he claimed to be the righteous ruler appointed by God on the basis of his lowly mother's miraculous conception of him while she was in the temple of Azu. No claims made by the ruler-priests could be regarded as proof of their divine appointment. The only proof of the deification of the "son" was resurrection from the dead. The Habiru/Hebrew broke the first two commandments when they allowed themselves to be influenced by peoples with an inferior moral code and an animistic-shamanic worldview. Such syncretism brings decay and destruction to the True Faith. The catechism cites examples: Exodus 32; Judges 2:11-15, Psalm 78:56-72; Jeremiah 32:30-35. We will consider the last three first, as the example from Exodus 32 is not an example of syncretism. The word “Baal” means Lord or Master. It can sometimes refer to the Lord, as in Baal Shalisha, meaning the Three God (an early Trinitarian reference? ); a Deity associated with the number 3, a triune God. The number 3 is repeatedly found in connection to the most enlightening passages and the most astonishing acts of God. Jonah was 3 days in the belly of the whale. Moses was hidden for 3 months (Ex. 2:2). Job's 3 friends struggled with the mystery of why the righteous suffer. Moses asked permission to make a 3-day journey into the wilderness to worship. Abraham traveled 3 days to a mountain only God could reveal and upon which God provided His own sacrifice. The Covenant God made with Abraham involved cutting up 3 animals that were 3 years old. God in 3 Persons visited Abraham (Gen. 18). The 3 measures of flour made into cakes for those Visitors. The 3 gifts offered them: curds, milk and a calf. Abraham prayed 3 times for Sodom. Joseph had a dream of a vine with 3 branches (Gen 40:10-12). The “Son of Man” appeared with 3 men in the fiery furnace. Jesus rose on the third day. Ashtoreth shrines at high elevations were dedicated to the moon goddess. As the moon merely reflects the radiance of the sun, it was regarded as an inappropriate symbol for the Creator among the Habiru and no lesser god or goddess was to be worshiped. The Habiru rebellion expressed itself in accommodating to the cultures around them. So God abandoned them to their dark ways. Their paths led them to destruction. I am again reminded of the demise of the Episcopal Church. The Valley of Ben Hinnom is the supposed area south of Jerusalem where the offal was burned. It was characterized by fires and constant smoke plumes. Diseased and impure corpses were burned there. It became a metaphor for the wrath endured by the dead in Ge-henna. The word Molech has a meaning similar to Baal. It means king. Molech was an Ammonite fire deity known among the Moabites as Chemosh. The ancient Habiru did not associate the elements of fire, water, air, and earth with the Creator. To do so would have been regarded as idolatry since these were created. Nor did the Habiru practice human sacrifice. Such practices were found among other peoples, but for the close-knit Habiru these practices were forbidden. Example 4 - (Exodus 32): When the people saw that Moses was so long in coming down from the mountain, they gathered around Aaron and said, “Come, make us a god who will go before us. As for this fellow Moses who brought us up out of Egypt, we don’t know what has happened to him.” Aaron answered them, “Take off the gold earrings that your wives, your sons and your daughters are wearing, and bring them to me.” So all the people took off their earrings and brought them to Aaron. He took what they handed him and made it into an idol cast in the shape of a calf, fashioning it with a tool. Then they said, “This is your god, Israel, who brought you up out of Egypt.” When Aaron saw this, he built an altar in front of the calf and announced, “Tomorrow there will be a festival to the Lord.” So the next day the people rose early and sacrificed burnt offerings and presented fellowship offerings. Afterward they sat down to eat and drink and got up to indulge in revelry. Then the Lord said to Moses, “Go down, because your people, whom you brought up out of Egypt, have become corrupt. They have been quick to turn away from what I commanded them and have made themselves an idol cast in the shape of a calf. They have bowed down to it and sacrificed to it and have said, ‘These are your gods, Israel, who brought you up out of Egypt.’ “I have seen these people,” the Lord said to Moses, “and they are a stiff-necked people. Now leave me alone so that my anger may burn against them and that I may destroy them. Then I will make you into a great nation.” But Moses sought the favor of the Lord his God. “Lord,” he said, “why should your anger burn against your people, whom you brought out of Egypt with great power and a mighty hand? Why should the Egyptians say, ‘It was with evil intent that he brought them out, to kill them in the mountains and to wipe them off the face of the earth’? Turn from your fierce anger; relent and do not bring disaster on your people. Remember your servants Abraham, Isaac and Israel, to whom you swore by your own self: ‘I will make your descendants as numerous as the stars in the sky and I will give your descendants all this land I promised them, and it will be their inheritance forever.’” Then the Lord relented and did not bring on his people the disaster he had threatened. Exodus 32 concerns the golden calf that Aaron made. This is an image of Horus and is the dynamic equivalent of the idea of the "Lamb of God." The Hebrews asked the ruler-priest Aaron to create for them a graven image (Hebrew: pesel). Apparently, Aaron was one of the members of the priestly caste trained in metal work. 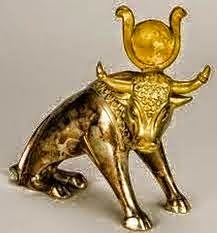 The image he formed of gold incorporated the sun and would have been a representation of the divine overshadowing of the Calf of God, and an image of Horus as the appointed. Below is picture of what it would have looked like. The calf is suggestive of Horus as a child. Horus' anthropomorphic form is either as a adult male or more usually as a boy wearing the sidelock typical of royal Egyptian youth. On cippi, Horus as a boy is often shown dominating crocodiles and serpents. Consider this in light of the Woman, the Child, and the Dragon in Revelation 12. Consider also the red cow of Numbers 19 that stands as a perpetual symbol of Israel's need for cleansing. The cow is sacrificed and burned outside the camp and the ashes used for "water of lustration." (Num. 19:9) This account from Exodus 32 is not an example of syncretism because Horus was not regarded as the calf of God by any other peoples except the ancient Horites, Abraham's ancestors. What we have is an interpretation of early Horite theology through the lens of the Deuteronomist Historian. The accusation that Aaron failed in righteousness likely comes from the iconoclastic Deuteronomist, the last known editor of the Old Testament material. The Deuteronomist urged the breaking of images. "... thus shall ye deal with them; ye shall destroy their altars, and break down their images, and cut down their groves, and burn their graven images with fire." (Deut. 7:5) Failure to do this served as an example of moral failure on the part of Israel's rulers and justified the terrible treatment which the Jews received at the hands of the Babylonians, far worse than they ever experienced in Egypt where their rulers were recognized by the Pharaohs. The Deuteronomist presents a religion quite different from that practiced by Abraham and his Nilo-Saharan ancestors. It moves the focus from the Righteous Ruler who would be conceived by divine overshadowing to the theology of the land as Israel’s rightful possession if she obeys the Law. This is the beginning of political Zionism. Why did the nations make such images? Comment: One difference between the Habiru religion and the religions of other peoples was this matter of gaining favor from the deity. For the Habiru, God could not be appeased by offering food, wine, oil, grain or a sacrificed animal or child. Propitiation involved sacrifice that adhered to the ritual law; in other words, sacrifice on God's terms alone. J. I. Packer in "Knowing God" (p. 207) explains that there is a distinct difference between pagan and Christian propitiation: "In paganism, man propitiates his gods, and religion becomes a form of commercialism and, indeed, of bribery. In Christianity, however, God propitiates his wrath by his own action. He set forth Jesus Christ... to be the propitiation of our sins." Are all carved images wrong? Comments: God gave explicit instructions to the artisans and craftsmen concerning how objects for the Temple were to be made. He also gave specific instructions as to how all these objects were to be consecrated, that is, set aside for sacred use. God had been doing this with the Habiru for a long time before Moses. Consider how God gave instructions to Abraham and Jacob on how to construct an altar. Are idols always carved images? An idol is anything that comes between us and our Creator or that leads us astray from the Truth revealing in Jesus Christ. How was Jesus tempted to break the first two commandments? Jesus’ love of God was and is perfect adoration. He is the Righteous Son who endured the cross in order to win his bride the Church and to reign eternally. He shall wipe away every tear and in His presence every sorrow shall be forgotten. C.S. Lewis’ explains in “The Lion, The Witch and the Wardrobe” that the evil Witch didn't realize that there is an older magic from before the dawn of time. It is the magic of divine love within the Trinity extended to humble clay like ourselves. How will idolatry affect you? If we commit to follow a false leader or cause, we will be led astray. Only one leader has the power to lead His people to eternal life: Jesus Christ, the Righteous. He is the firstborn from the grave and by his resurrection He delivers to the Father a "peculiar people." He leads us in the ascent to the Father where we receive heavenly recognition because we belong to Him. How can you love God in worship? Comment: C.S. Lewis wrote in Letters to Malcolm, “Relying on God has to begin all over again every day as if nothing had yet been done.” Trusting God is one way that we worship God. We are more likely to slip into idolatry when we fail to trust and rely on God in the smallest details of daily life. If ever these attributes were embodied in one man, it was in the person, mind, and soul of Thomas Jefferson. He was the scientist, lawyer, author, musician, student, and philosopher-king who wrote the United States of America into existence and who defined what it was to be an American citizen for generations unborn. He was to be America’s lighthouse of wisdom, vanguard of thought and science, and navigator of philosophical waters no man had ever ventured out upon. Jefferson took the mere thought and conjecture of European Enlightenment thinkers and built an American empire upon it. Though many ideals Jefferson held in esteem he did not personally accomplish, he defined what he hoped the future course of America would be. This definition began with education. Thomas Jefferson’s theory of education formed a deeply interwoven epistemology centered around his views on religion, politics, and the essence of human nature. For Jefferson, his educational theory also defined what it meant to possess natural human rights and the drive to impart those rights to all Americans became the sole purpose of the last half of Jefferson’s life. Thomas Jefferson was born on April 2, 1743 in Albermarle County, Virginia, to Peter Jefferson and Jane Rudolph. While Jefferson was not born to the wealthiest of families; he was still from a rather distinguished line of descent. His father, Peter, was a self-educated intellectual and the first source of knowledge for a man who would remain a student until his last moments on Earth. After his father’s death in 1757, when Jefferson was only fourteen, Thomas was sent to receive a classical education in Greek and Roman literature and grammar under Dr. James Maury. Maury would give Jefferson the key to unlock prior millennia of thought and philosophical contributions and further the yearning Jefferson had for knowledge. The crux of Jefferson’s philosophy was formed from these men. Jefferson was endless in his praise of Small, Wythe, and Fauquier. He attributed his “great good fortune” and “what probably fixed all the destinies of my life” to William Small. About Wythe, Jefferson wrote, “No man ever left behind him a character more venerated than George Wythe”, and Jefferson also proclaimed “[Wythe was] honor of his own, and model of future times.” It is apparent then, that to understand the philosophy of Thomas Jefferson, which is the intellectual font of his educational theory, the prior philosophy of his mentors and their predecessors must be known. Small and Wythe no doubt reflected the predominant philosophy of the 18th century, which can be generally described as the Enlightenment. In the wake of the Protestant Reformation, growing religious skepticism coincided with watershed advances in science and mathematics that led certain thinkers to question whether man was entirely dependent on God, where mankind obtained true knowledge, and even the very existence of the Christian God. Thomas Jefferson based his philosophy on the belief that Christianity was not a perfect source of knowledge or even the only source of truth. Jefferson averred David Hume and Francis Bacon among others in his skepticism of the dogmatic Christian Church. To Jefferson and other Enlightenment intellectuals, Christianity, among other religions, had caused such repeated injuries to mankind that it was not fit to be the basis of civil government. Enlightenment thinkers, following the teachings of Aristotle and subsequent philosophers, sought true knowledge from observation, experimentation, and sense experience since the Church, the only other traditional authority, could not be trusted. This influence on the physical and empirical world led to the proliferation of a materialist worldview that placed scientific knowledge and governmental or political philosophy at the forefront of human understanding. However, the humanistic influence on Jefferson does not justify classifying Jefferson as agnostic or atheistic. Jefferson does not deny the existence of God or of some other supernatural Deity. That being said, Jefferson’s skepticism does echo Enlightenment rationale by limiting his Gospel reading to that of Jesus’ direct quotations alone. He saw the followers of Jesus Christ and the subsequent Catholic Church as the source of corruption within Christianity, not Christ himself, whom Jefferson viewed simply as a great moral teacher. Jefferson once very bluntly wrote that Christ’s writings were “as easily distinguishable as diamonds in a dunghill” when compared to the writings of the Apostles. While Jefferson did convey an impersonal tone in his discussion of God, it is equally apparent that Jefferson did not go to the extreme of denouncing religion, but denounced the corrupting human influence upon it. Jefferson then, seems to be acting mostly politically when he described himself as “rational Christian” since Jefferson’s personal beliefs do not appear to align with the Protestant Evangelicalism that was prevalent in the United States’ population at the time, as it is today. On a superficial level, it appears that Thomas Jefferson is only suggesting sophisticated classics to his student, but his recommendations have much deeper meaning than what is apparent on the surface. All of the philosophers, emperors, and thinkers Jefferson listed belong to the tradition of Stoicism, the belief that a truly educated and intellectual person would not experience the degrading emotions of human life that so often ensnare and entangle mankind, keeping man from reaching the true potential of his life. Among these philosophers are also a number of early materialists and empiricists, who were the origin of the humanistic philosophy that it appears Jefferson is upholding. Jefferson also lists Plato’s Socratic dialogues that teach that Knowledge, above all else, is the prime virtue, that Knowledge precedes all human action, and that Knowledge is the foundation of all the good a man can do in his life. The question of the chronology of natural rights is not, then, a clear cut one and the argument could be reasonably made that Thomas Jefferson sees natural rights as only being actualized in the thoroughly enlightened individual. To pull the different strands of Jefferson’s thoughts together before proceeding any further, Jefferson’s view was that education, which is paramount in securing man’s natural rights, is inseparable from political education because the role of government is the preservation of those natural rights secured by the enlightened, but also that education must be separate and free from hegemony by one religion, since that system can be schismatic and destructive to society. It was with these ideals in mind that Jefferson expounded his educational theory from his own mind into the world around him, and it was this venture that brought Jefferson from the prime of his life through his last half century. Jefferson’s quest began on June 18, 1779 with the drafting of Jefferson’s Bill for the More General Diffusion of Knowledge. The Bill was a preventative measure on Jefferson’s part to ensure that the freedoms the fledgling nation was fighting for would not be quickly lost or forgotten. Even though it did not pass, Jefferson’s Bill was an early outline of the system of education he would advocate throughout the remainder of his life. The first level, or grade, of schooling would consist of Reading, Writing, Arithmetic, and the reading of ancient Greco-Roman works to serve as historical education. This curriculum was replaced in a second grade by Languages, Mathematics, and Philosophy, with Philosophy being defined as Ideology (which Jefferson associated with the French definition more closely associated with Science than with Metaphysics), Ethics, the Law of Nature and Nations (Political Philosophy), Government, and Political Economy. The third, or professional grade, consisted of Theology, Law, Medicine, Pharmacy, Surgery, Architecture, Military and Naval Projectiles, Technical Philosophy (more closely associated with Metaphysics), Rural Economy, and the Fine Arts. In his Bill, Jefferson also outlined a hierarchical structure to education, with all students, male or female, being admitted without charge for three years to the public schools within their ward, and the highest achieving echelon of those students being transferred to the university or college level with others being discontinued from the school system, in hopes that, at the end of what we would refer to as secondary school, only the most elite intellectuals of the state would be admitted to the College of William and Mary. During Thomas Jefferson’s presidency, his ideology took another step towards fruition. This began with the founding of West Point in 1802, but Jefferson sought much more than a mere military academy. He strove to establish a state university that offered education to the highest intellectuals of the American populace, in order that they might serve the remaining population through sound government and advancement of knowledge. The Albermarle Academy, which Jefferson saw as the next tangible opportunity to further his educational theory was a beginning step, but was not broad enough in its reach to accomplish Jefferson’s vision. Not accepting defeat, Jefferson petitioned for legislation that would create lower tier public schools in Albermarle County which would then feed into the newly christened Central College (a rejuvenated Albermarle Academy). This legislation, which would have placed the financial burden on taxpaying citizens currently over-encumbered by a severe drought, was not passed. The proposition would be revisited again and finally passed on January 25, 1819. This was the first major step towards what would become known as the University of Virginia. In 1819, Thomas Jefferson’s life’s work was accomplished. The University of Virginia obtained a charter from the state legislature that affixed it atop the state’s hierarchy of public schools and proclaimed Thomas Jefferson as its father. The immediate ramifications were important, but the philosophical implications were truly profound. Thomas Jefferson had, in his seventy sixth year of life, achieved the realization of the sum of nearly two and a half millennia of thought. He had obtained for the United States of America a universally accessible system of thorough public education. It is critically important to remember what forces drove Jefferson to an almost lifelong pursuit that culminated in the University of Virginia in Charlottesville. Thomas Jefferson had, in his view, obtained the salvation of his country. Jefferson had given the gift of thorough, right-minded, free-thinking education to Virginians that would allow them to claim their God-given natural rights of life, liberty, and the pursuit of happiness. Jefferson had redeemed his constituents and countless generations of Americans by raising them to the ability to truly own their rights, something that only the aristocratic classes of the Old World had previously obtained. Jefferson now offered true human citizenship and identity to the citizens of the United States. Near the end of his life, Thomas Jefferson, in his own Autobiography, asked himself, “Is my Country the Better for my Having Lived at All?” The conclusion that must be drawn is that Thomas Jefferson not only lived, but he burned through his life like a supernova echoing throughout the cavernous voids of the heavens, never ceasing, but resonating throughout the Universe in a myriad of forms. Jefferson’s thought is similarly omnipresent in modern America, ranging in influence from a drizzle of nostalgic remembrance, to an intellectual deluge; the kind of gully-washing thunderstorm all too common in the dog days of a Virginia summer. Addis, Cameron. Jefferson's Vision for Education, 1760-1845. New York, NY: Peter Lang Publishing, 2003. Gish, Dustin, and Daniel Klinghard. Resistance To Tyrants, Obedience To God. Lanham, MD: Lexington Books, 2013. Kerouac, Jack. On The Road. New York, NY: Penguin Books, 1959. Koch, Adrienne. The Philosophy of Thomas Jefferson. New York, NY: Columbia University Press, 1943. Malone, Dumas. The Sage of Monticello. Boston, MA: Little Brown and Company, 1892. National Intelligencer. 8 August 1776. Okeshott, Michael. "Two Treatises on Government." Two Treatises on Government: By John Locke 5 (1962): 100. Accessed November 11, 2014. http://www.jstor.org/discover/10.2307/3020511?uid=2134&uid=3739656&uid=2129&uid=2484590587&uid=2&uid=70&uid=3&uid=2484590577&uid=3739256&uid=60&sid=21105174660713. Rayner, B.L. Sketches of the Life, Writings, and Opinions of Thomas Jefferson. New York, NY: A. Francis and W. Boardman, 1832. Wagoner, Jennings. Jefferson and Education. Chapel Hill, NC: University of North Carolina Press, 2004. "The Declaration of Independence." Ushistory.org. Independence Hall Association, n.d. Web. 08 Nov. 2014. Rayner, B.L. Sketches of the Life, Writings, and Opinions of Thomas Jefferson. New York, NY: A. Francis and W. Boardman, 1832. Page 19. Wagoner, Jennings. Jefferson and Education. Chapel Hill, NC: University of North Carolina Press, 2004. Page 22. Gish, Dustin, and Daniel Klinghard. Resistance To Tyrants, Obedience To God. Lanham, MD: Lexington Books, 2013. Page 23. Koch, Adrienne. The Philosophy of Thomas Jefferson. New York, NY: Columbia University Press, 1943. Page 23. Jefferson most likely viewed “the good” very differently than Plato, whom this phrase is referencing, did. Malone, Dumas. The Sage of Monticello. Boston, MA: Little Brown and Company, 1892. Page 15. These grades did not directly correspond to age as in modern schools (i.e. 6th grade for 12 year olds, 7th grade for 13 year olds) but grades are only graduated from after content mastery had been achieved. A term used by Jefferson referring to a system of urban organization that was never implemented (square townships of approximately 100 square miles each). Addis, Cameron. Jefferson's Vision for Education, 1760-1845. New York, NY: Peter Lang Publishing, 2003. Page 25. The National Intelligencer. 8 August 1776.